Follow-ups on a quote are important. In fact, I’d say that they are critical and a must have tool. In my own experience, following-up on a proposal increases your chances to win the business tremendously. 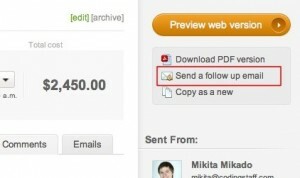 That’s why we’ve added follow-ups as a new feature to Quote Roller. Before I get to this new cool feature, I’d like to explain why it’s so important to follow-up on proposals you send out to clients. First of all, following up on a proposal shows your continual interest in their project. It’s really important for a buyer to see that you are keenly aware of what they need and have put a priority on their project. This instills confidence in you as a supplier to deliver and gives you or your client a chance to clarify any details. Secondly, following-up helps your company to stand out of the crowd and above the shoulders of other suppliers, which obviously increases your chances in wining the quote. This is a great way to refresh your client of the benefits of choosing you. And finally, following-up helps to establish a relationship with the buyer, which is likely to be the most important thing for the future. Because of the points raised above, we decided to automate following-up on quotes in Quote Roller. 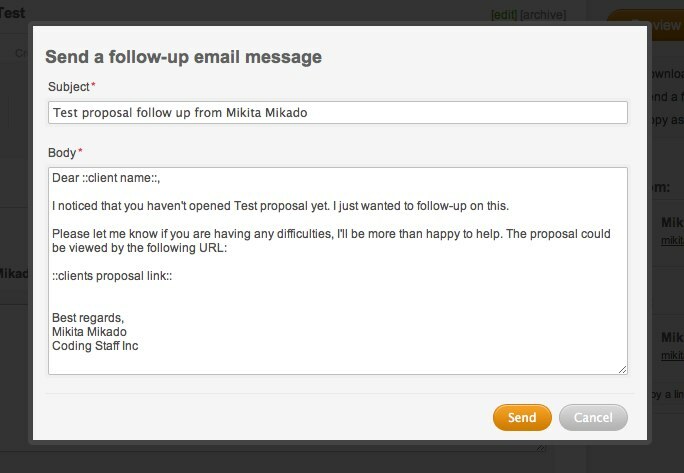 If the proposal has a sent, viewed or discuss status, you’ll see a follow-up button in the top right corner of the application. This handy feature should work both as a tool and a reminder for follow-up emails. However, even though it is really important to follow-up, it is also important not to annoy the customer, don’t abuse this relationship. My advice here, would be, use the tool, but use it wisely.